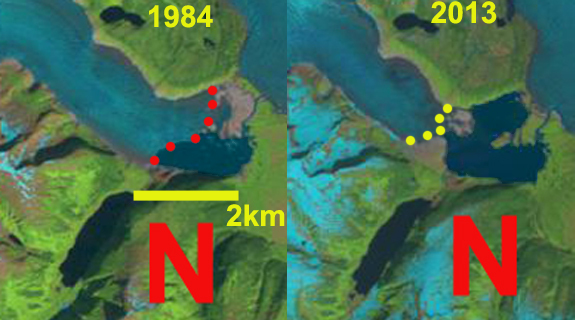 Above is a paired Landsat image from 1984 left and 2013 right indicating the 1100 m retreat during this period. 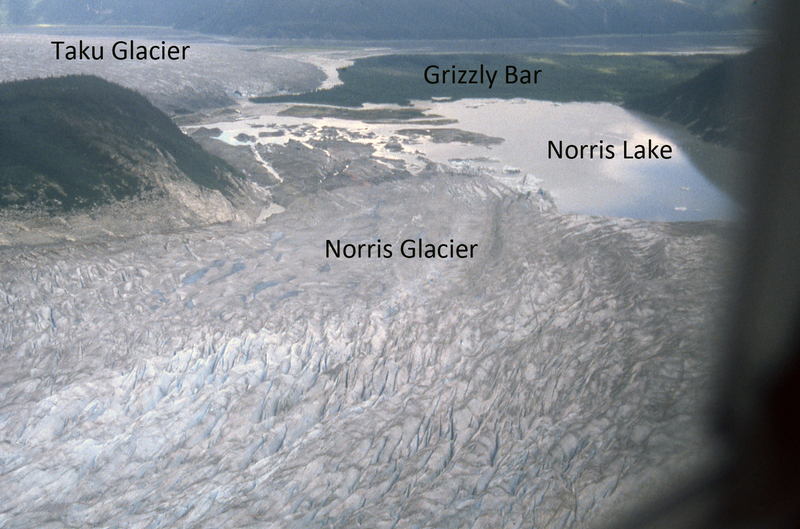 Norris Glacier began retreating before 1890 and has continuously retreated 2050 m from its 19th-20th maximum achieved around 1915. 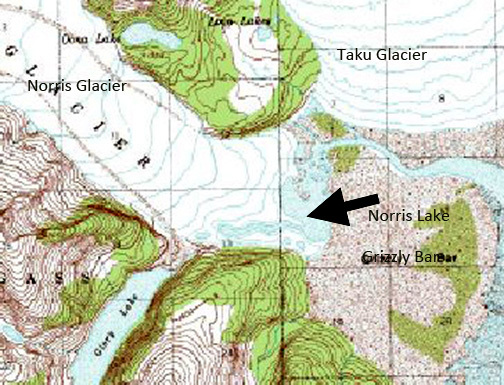 The glacier ended in a lake referred to here as Norris Lake from 1948 until 2007. By 2010 the glacier had retreated from this lake. Here we examine images from fieldwork conducted by the Juneau Icefield Research Program and overflights as part of the program from 1975 to 2010 and Google Earth imagery. I have had the chance to cross this glacier on ski a half dozen times as part of JIRP, and is was seldom an easy traverse, hence the names death valley and dead branch for portions of the glacier. 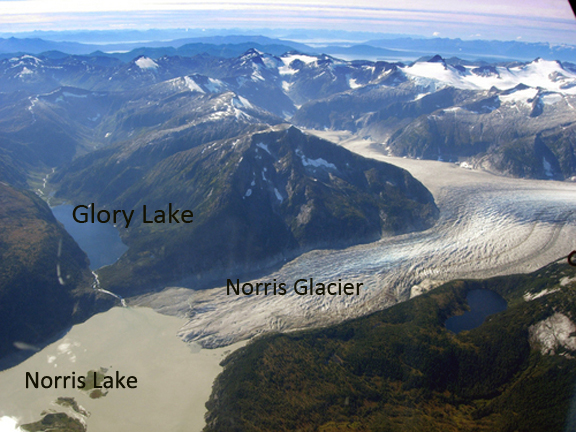 Norris Glacier does not receive much attention as the program is focused on the Lemon Creek Glacier and the more famous and largerTaku Glacier, and does not garner much of our attention. In 1948 the USGS map (top image) indicates Norris Lake was a narrow 200-500 meters wide lake and the glacier terminus was only 200 to 700 meters from Grizzly Bar, increasing with distance south along margin, an outwash plain built by the glacier beyond its advanced terminus position. By 1975 (second image; taken by Maynard Miller JIRP director for fifty years) the glacier had retreated an additional 250 meters, Norris Lake had expanded, but still had considerable ice along its western margin. The terminus was still extending a kilometer downvalley of the outlet of Glory Lake. 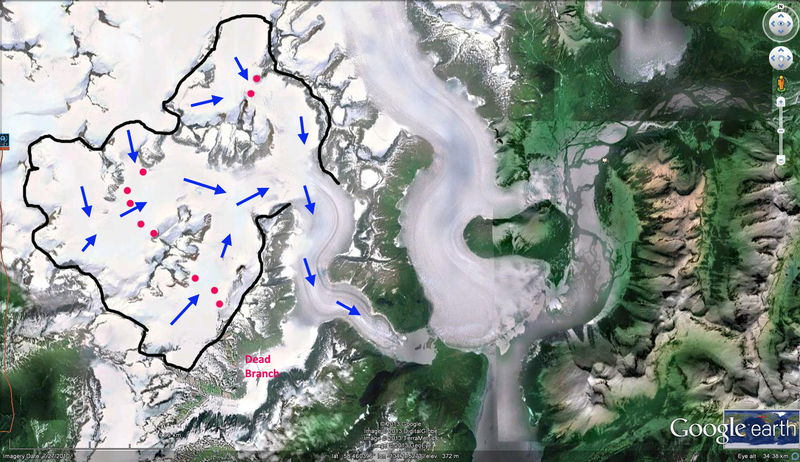 The view of the entire glacier in Google Earth illustrates the direction of flow and accumulation sources blue arrows, typical snowline red dots and glacier boundary black line. 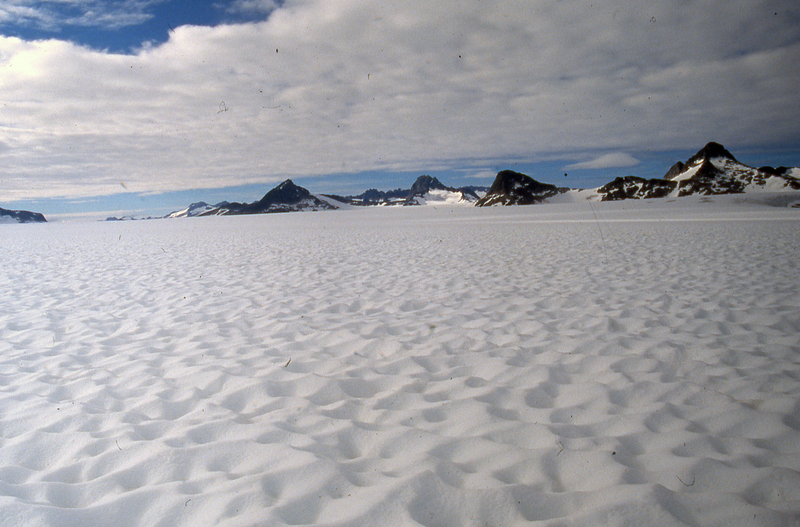 < In 1998 I had the opportunity to fly over the glacier at the end of the field season. 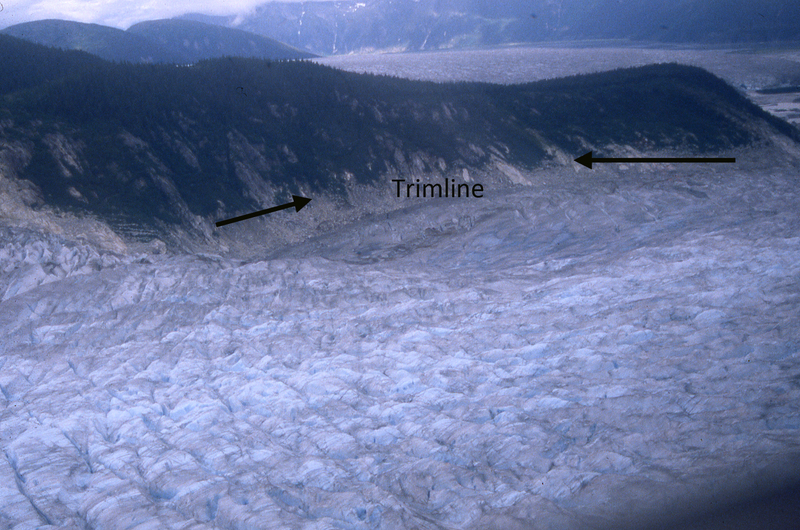 A series of images indicates the trimline that had developed with the recent glacier thinning of the last 50 years. Norris Lake had expanded to a length of 1.2 km on the north shore and 1.9 km on the south shore from Grizzly Bar. 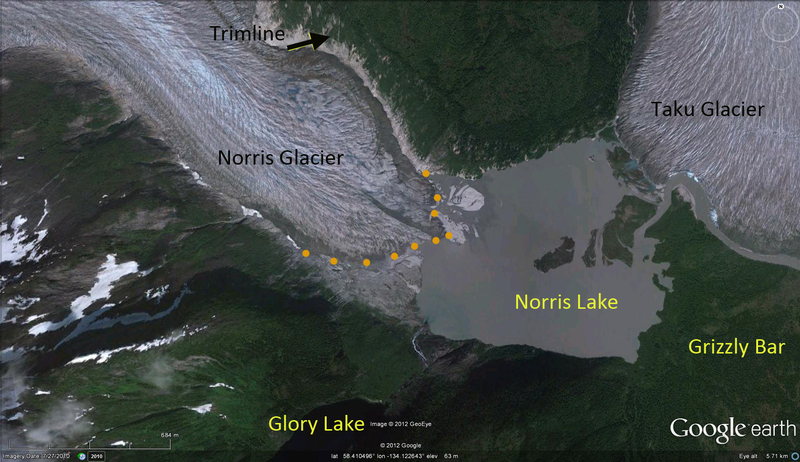 In 2010, images below, the glacier barely reached the edge of Norris Lake and the terminus was well up valley from the Glory Lake outlet, Grizzly Bar was 2.1 km from the terminus. By 2011 the glacier no longer reached the shore of Norris Lake. 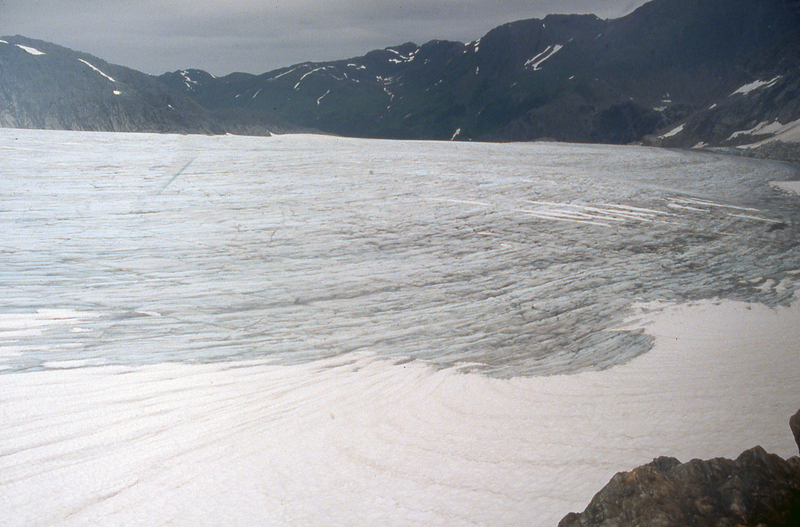 An examination of the icefall feeding the glacier terminus area indicates considerable melt out of crevasse features, indicating that flow is not that vigorous through the icefall above the terminus at 300 m, suggesting retreat will continue. 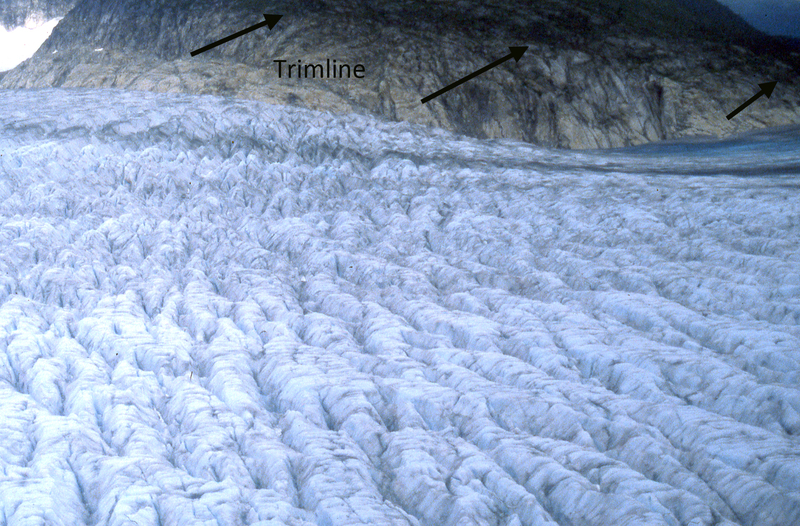 The trimline hear has increased from 20 m to 50 m above the ice surface since 1975. 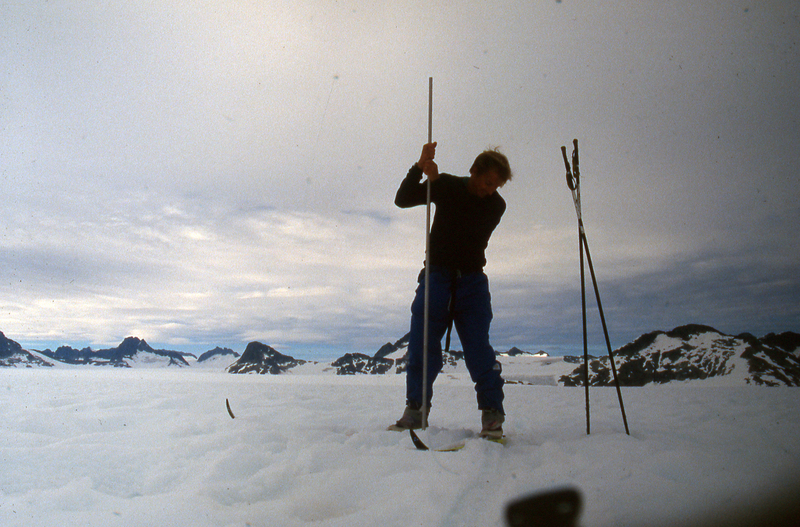 In the summer of 1998 we conducted extensive probing in the accumulation zone of the glacier, last two images in sequence below. This combined with annual identification of the snowline since 1994 indicates insufficient snowpack and continued thinning. This glacier has the majority of its area between 800 and 1200 m, with the average snowline since 1994 being 1000 m. Maximum accumulation is 1.5 m, whereas maximum ablation at the terminus exceeds 12 meters, hence you need a much larger accumulation zone to offset the higher terminus ablation. 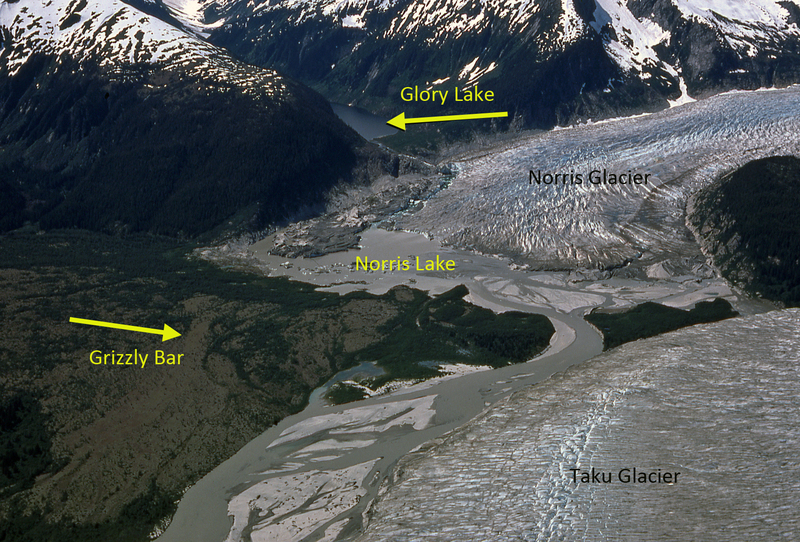 This glaciers retreat and lake expansion of the terminus follows the same pattern as all other glaciers of the Juneau Icefield except the Taku Glacier: Gilkey Glacier, Field Glacier, Eagle Glacier and Antler Glacier. This entry was posted in Glacier Observations and tagged glacier retreat global warming, Juneau Icefield Retreat, norris glacier retreat, norris glacier snowline. Bookmark the permalink.